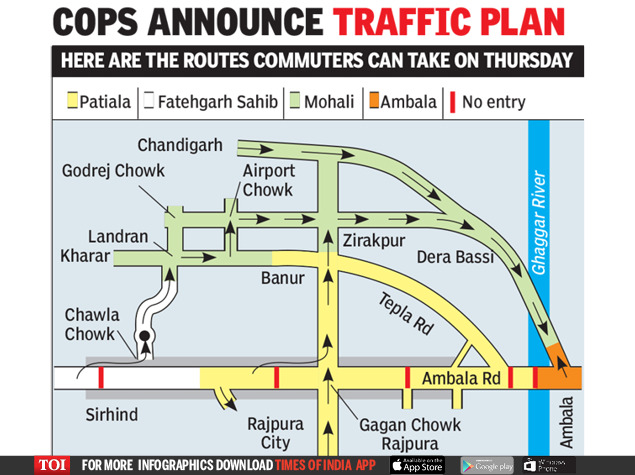 PATIALA: For the convenience and safety of the commuters and public in general, the district police Patiala district police chief Dr S Bhupathi informed that the plan has been prepared for the convenience for all those traveling from Punjab, Chandigarh to Ambala, Delhi side and for those entering Punjab or Chandigarh from Haryana, Delhi side. The stage is all set for the big day tomorrow with forces deployed in strength on both sides of the state border.While the Indian National Lok Dal (INLD) is adamant on taking out a march towards Punjab to dig the SYL canal on Thursday, the district administration and police officials have geared up to keep the status quo and law and order maintained. All types of vehicles are restrained to go from G.T.Road Rajpura to Shambhu Barrier. Any type of heavy vehicles are banned to travel from Sirhind to Ambala from any route. All types of light vehicles, going from Ludhiana, Khanna, Patiala side to Ambala Delhi side can go Via Sirhind-Fatehgarh Sahib-Landran Chownk-Banur or Air Port Road Mohali to Zirakpur-Dera Bassi-Lalru-Ambala City. The vehicles coming from Delhi-Ambala Haryana Side entering Punjab or Chandigarh can enter Via Ambala City-Lalru-Dera Bassi-Zirakpur-Banur or Airport Road Mohali Landran Chownk, Fatehgarh Sahib, and Sirhind. In case of any clarification or help, people may contact at the given mobile phone numbers: 95929-12449, 85588-18127, 82880-09996, 95929-12500, 98764-32100.